Penelope Stout came from the Netherlands in 1643, intending to land at New Amsterdam (New York). However, the ship she and her first husband were on wrecked at Sandy Hook, and they made it to shore along with several other passengers. I hesitated to write about this colonial woman because the confirmed facts about her are few and somewhat sketchy. However, she has become a New Jersey heroine, and I think she deserves a nod on our blog. Let’s start with her name. Penelope’s maiden name I do not know. Most accounts say her first husband was a Dutchman, and his name is variously given as Prince, Van Princin, Princis, Van Princis, von Printzen, and Princess, with perhaps a few more variations thrown in. I’ve seen her referred to several times as Penelope Princess or Penelope Van Princess. She later married an Englishman, James Stout, so she is listed in many sources as Penelope Stout. So, back to the shipwreck. After the survivors got to shore, the others decided to leave behind Penelope’s husband, who was ill, while they tried to walk to the colony at New Amsterdam. Penelope refused to leave her husband alone, so the others promised to send help for them as soon as possible. The two of them were left on the shore. It’s not clear whether her husband was ill before the shipwreck or because of it. There are also accounts that say the entire party was attacked and massacred by Indians, but my limited research leads me to doubt that. While they waited on the shore alone, the couple was attacked by Indians. Penelope’s husband was killed, and Penelope was severely injured. Apparently she was left for dead. She crawled into a hollow tree and survived several days there. Some accounts give details of her injuries, but these were mostly written long after the fact, so I don’t know how true they are. She supposedly had a severe head wound, a shoulder wound, and an abdominal wound. Some sources say she was discovered by an old Indian man. Others say she knew she was starving and made herself known to a nearby tribe, the Navesink, a division of the Leni Lenapi. portrayed on the front. It shows an Indian man carrying an inert woman over his shoulder near the ocean waves. However she got to the Indian village, they tended her wounds and nursed her back to health. When she was well enough to travel, the Indians took her (some say sold her) to the Dutch at New Amsterdam. Later she married Englishman Richard Stout. They lived near where Coney Island, Brooklyn, is now, and had ten children. They moved to the Middletown, New Jersey, area around 1665. This was near where the Leni Lenapi who had previously helped Penelope lived. Some stories say that the same old chief who had rescued Penelope after the shipwreck was living there. He is said to have rescued her again by warning her of a planned attack by another Indian tribe. She was able to avoid it. One account says the women and children were sent away in boats. The men stayed to fight the Indians and prevailed, then bought the natives’ land. Penelope is said to have lived to the age of 110. Again, documentation is sketchy. Penelope is definitely mentioned as a witness in a slander trial in 1648, in Gravesend Town (the Brooklyn location). She is listed in the town records as Penelope Prince. It’s not certain whether she had not yet married Richard Stout, or if she used her former name. Dutch women sometimes used their maiden names, I’m told, but Prince was supposedly her first husband’s name, so there’s some ambiguity there. One source I found gave her a maiden name, Kent, but that’s a decidedly un-Dutch name. Even the date of her arrival in America is disputed, but we know she was a real person. Take what works for you from this tale, but don’t accept any detail I’ve presented as proven fact. 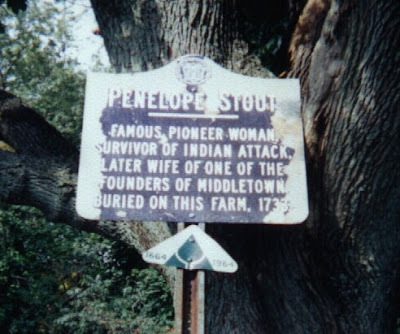 Penelope has been dubbed the Mother of Middletown (New Jersey), and the town has honored her status as a pioneer by naming Penelope Lane after her. Love colonial stories? Leave a comment below and you may win your choice of Susan’s Maine Brides collection or White Mountain Brides collection. Susan Page Davis is the author of more than sixty published novels. She’s always interested in the unusual happenings of the past. Her newest books include River Rest and Sleight of Hand. She’s a two-time winner of the Inspirational Readers’ Choice Award, and also a winner of the Carol Award and the Will Rogers Medallion, and a finalist in the WILLA Awards and the More Than Magic Contest. Visit her website at: www.susanpagedavis.com . True or not, it would make for a great book or movie. I think so, too, Debbie. There are so many fascinating stories buried in old records! What a life she led! Thsnk you for sharing this interesting story, Susan. What an interesting woman, no matter what the true story is. Thank you for sharing. No need to enter me in the drawing because I have both books. What an interesting post. I've never heard of Penelope or her story. Whether all of it true or not, it makes for a great tale. Thanks, Susan and Martha. I tend to think "most" of it is true. Love hearing those type of history based storeis. What a tantalizing glimpse of an earlier life. Just imagine the stories she would tell her grandchildren,maybe great-grandchildren . Irene H Wilson ( groan,I'm tekkie challenged and can't get my name under comment as. I'm with you, Irene. And I'm a techno-klutz myself! Yes, I do love colonial stories and even if there are questions about her life, Penelope was certainly a fascinating woman! Thanks, Connie! I agree--as soon as I saw a mention of her, I had to find out more. Penelope sure had perseverance! Susan, thank you for this fascinating post! And the winner is Connie Saunders. Congratulations!